Change the look of a bed with a covered comforter. It can replace a top sheet and blanket, and the removable cover of the comforter makes laundering easy. 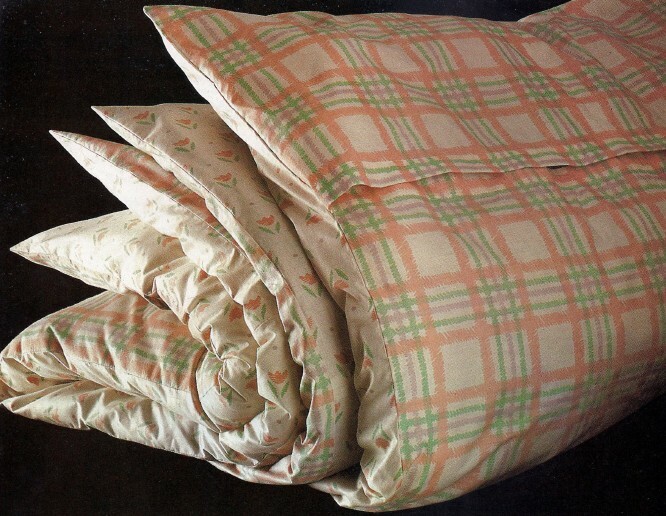 Sew your own comforter, or use a purchased one of down or of polyester batting. Chooseawashable,lightweight, firmly woven fabric for the cover. Sheets are good fabric choices because they do not require piecing. Seam decorator fabrics together by using a full fabric width in the center of the cover, with partial widths along the sides. Leave a 36″ (91.5cm) opening in the back-of the cover for inserting the comforter. Place the opening about 16″ (40.5 cm) from the lower edge on the inside of the cover so it will not show at the ends. Use snap tape, hook and loop tape, a zipper or buttons for closure. Cut the front of the cover 1″ (2.5 cm) larger than the comforter. Cut the back of the cover according to the closure method you choose. For button closures, add 5W’ (14cm) to back length. For a snap tape, hook and loop or zipper closure, add 1W’ (3.8 ern) to back length. Decorator fabric or sheets for cover, and small amount of extra fabric for tabs. Snap tape, hook and loop tape, zipper or buttons. Gripper snaps to hold comforter in place.